(CNN) - On the same day the Supreme Court announced its decision to uphold the health care law, a Democratic opposition research group is pushing a video from 2006 that shows Mitt Romney praising the idea of an individual insurance mandate–a key component of the Affordable Care Act that he now chastises. As former governor of Massachusetts, Romney signed off on a law requiring individuals to purchase health insurance. Romney's opponents now point to the law as a way to paint the presidential candidate as hypocritical when he blasts President Barack Obama's sweeping health care reform, which also includes a mandate. Late Wednesday night, on the eve of the high court's announcement, the Democratic group American Bridge 21st Century blasted out the six-year-old video, a VHS tape they said they "just found" in the Massachusetts state archives. "With regards to the individual mandate, the individual responsibility program that I proposed, I was very pleased that the compromise between the two houses includes the personal responsibility mandate. That is essential for bringing the health care costs down for everyone and getting everyone the health insurance they need," Romney said. 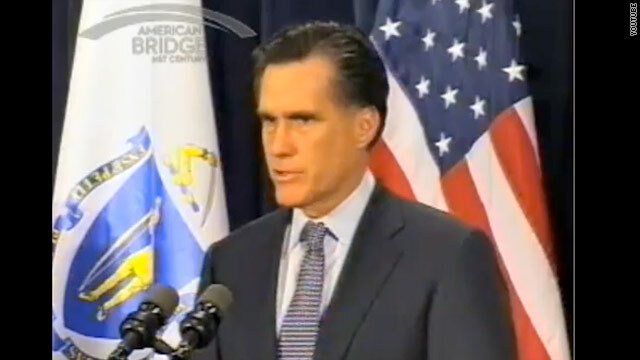 In his defense, Romney now says the Massachusetts health care law was designed for that state–and that state only. He staunchly opposes the notion of a federal mandate and repeatedly says he would repeal "Obamacare" on his first day in office. "What the Court did today was say that Obamacare does not violate the Constitution. What they did not do was say that Obamacare was good law or that it's good policy. Obamacare was bad policy yesterday, it's bad policy today," Romney said Thursday, responding to the decision. "Obamacare was bad law yesterday, it's bad law today." Romney's campaign did not immediately respond to requests for comment on the video. - CNN Political Reporter Peter Hamby and CNN Chief White House Correspondent Jessica Yellin contributed to this report. Mitt the waffler. Obamacare is Romneycare... just better and for everyone. Great victory for Obama and the Democrats! Well done! There is nothing new about Gov Romney's flip flopping on issues as significant as the health care mandate . He will continue to do so if he becomes the president as he has done in the past. The Tea Party members will force him to take decisions that he does not completely support and then he will back track on these issues when he faces the nation. Romney doesn't know whether he is scratching his watch or winding his a$$! Wait a minute! Romney is contradicting himself.......... he sounds............well hypocritical? I am so confused. The challenge facing Repugnants now is to find a candidate for VP who is so bad that all the attention will be on the VP slot, pulling attention away from Rob-money's flip flops and wild inconsistencies. John McCain had such a VP choice, so there is bound to be another repug who is just as vile a Slimey Sarah. Actually, now that i think about it, nearly all of them are that disgusting. Still laughing, wait, I have a comment . . . please, I just can't stop laughing, Mitt Romney is so funny and the SCOTUS bust the Repub. This stuff is pie in the face of the clown party of no. too funny. Ok-ok! Can not stop laughing. And that Mitchell Bachman face, was sold for a penny. Laughing and laughing and laughing . . . my stomach can't take it. (in my Boehner voice, "Republicans, we will not spike the ball when Obama-care is struck down. Funny, funny and funny. ROTFLMHO! gave this country to the socialist/liberals.